Heilly Station Cemetery is situated near Mericourt-l'Abbe on the road between Amiens and Albert. The 36th Casualty Clearing Station was at Heilly from April 1916. It was joined in May by the 38th, and in July by the 2/2nd London, but these hospitals had all moved on by early June 1917. 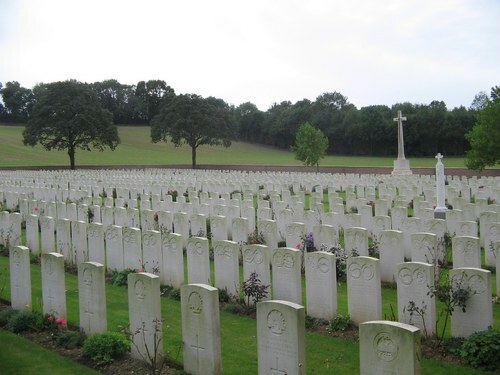 Of the 2,890 Commonwealth servicemen of the First World War buried or commemorated in this cemetery,only 12 burials are unidentified, and special memorials are erected to 21 casualties whose graves in the cemetery could not be exactly located.